Participation by telephone in our auctions is an option we are happy to offer you. We will gladly call you during the auction and help you to purchase the desired items. Bidding by telephone is possible only for lots with a price of at least 500 €. Please let us know at least 48 hours before the auction which items you wish to be called about. Please make sure that you are available and can be reached when your items are auctioned. The schedule in this catalogue will help you to estimate the exact time. We recommend that, in addition to your wishes regarding being called, you give us a bidding limit so that we may bid on your behalf in case we are unable to reach you. 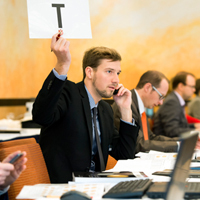 Please note that bidding by telephone can be a method of auction participation which offers less than complete security. We can make no guarantee that we will be successful in reaching you by telephone. For better chances of success, please visit our gallery auctions personally or give us a bid in writing.